Enjoy a 45-60 minute private hot air balloon flight. This experience is specifically designed for couples seeking that exclusively romantic experience. If you have a larger group interested in taking the experience, up to 10 guests can participate. Your guided experience will require about 3-hours of your time. Hotel pickup and drop-off is not included: you will meet at the Lebanon Warren County Airport. Confirmation email contains Waiver of Liability and Airport Map for parking information. Guests contact the Flight Status Information for weather go/no-go information just prior to scheduled meeting time(s). This tour guarantees that only you and your guest(s) fly with the pilot. 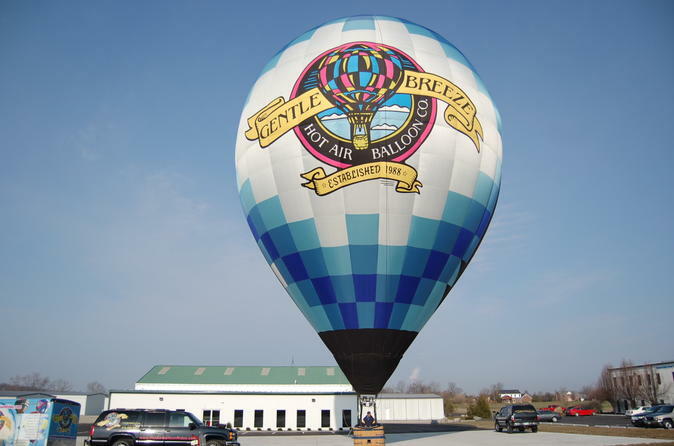 Enjoy a relaxing sunrise or sunset hot air balloon ride, lasting 45-60 minutes over the Cincinnati and Dayton Suburbs. Please allow up to 3 hours for the complete experience with your safety-minded crew. Includes complimentary bottled water and celebratory champagne toast (non-alcoholic substitution upon request and for passengers under the age of 21). You must be able to withstand a jar or jolt upon landing, equivalent to jumping off three steps or about 30". Individuals with heart conditions, back or hip problems, weak knees or ankles, fainting spells, recent surgeries of any kind (within 6 months) or currently under the care of a physician, please provide operator with this important information. Your pilot and crew need to know for your safety and flight arrangements. Anyone with doctor's limitations should contact your physician. All passengers that are currently pregnant must delay booking until post delivery. For your safety and the safety of others that may be on board with you, please supply your most accurate weight when making your reservation.